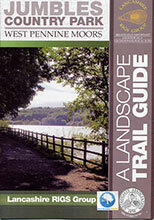 Two full colour field guides have been published by the Group to promote an insight and appreciation of Lancashire’s geology and scenery. 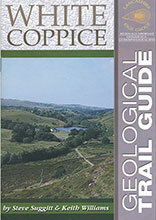 This twenty-page guide explores the geological features visible along Dean Brook at White Coppice, Chorley. It will be of interest to anyone wishing to find out more about the gritstone rocks, lead mining and quarrying of this exquisite part of the West Pennines Moors. 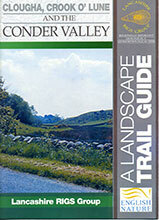 This guide explores a number of sites in the upper Hodder catchment which demonstrate the present-day and historical processes have shaped this river valley and channel. Aimed more towards geography and environmental science students, it draws on numerous research projects that have been conducted in the area over the past 20 years, presenting the results of these in language that is accessible to a non-specialist. Many maps, diagrams and photographs. Jumbles Country Park is located in the West Pennine Moors on the Boundary between Bolton and Blackburn. It centres on Jumbles Reservoir where there is a car park, visitor centre, and cafe plus excellent trails which link to the footpath network outside the park. The trail has been designed as a circular walk of about 4.5 miles but two of the locations may be reached by car and the other two are only a short walk from the car park. There are directions for people who want to walk the circuit but you should bring your own map as well. Location 2 – Jumbles Brook – walk along an earthquake! 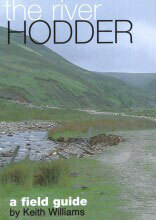 Location 4 – Affetside: a magnificent viewpoint from which to see the geology and landscape laid out all around you. *No footpath yet through the woods: great care needed. 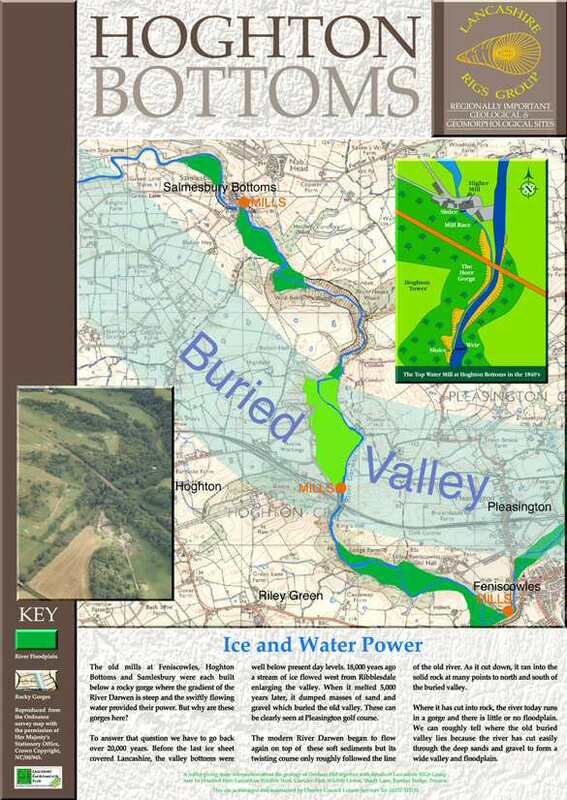 Located east and southeast of Lancaster, the guide explains how meltwater from the last icesheet shape the landscape as it poured down the Lune valley. Although it is possible to reach three of the locations by car, at two of them parking is restricted and the lanes are narrow. Cycling is the best way to get around but you will have to walk uphill for half a mile to the Clougha channels. 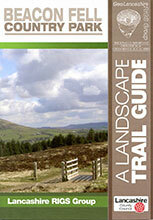 Beacon Fell with its visitor centre and cafe is probably the most popular country park in Lancashire. But it’s very existence is down to the rocks which it is made off – to the way that they have been folded to bring the tough Pendle Grit stone to the surface. This has resisted erosion compared to the surrounding Bowland Shales so they have been worn away leaving our upstanding beacon! 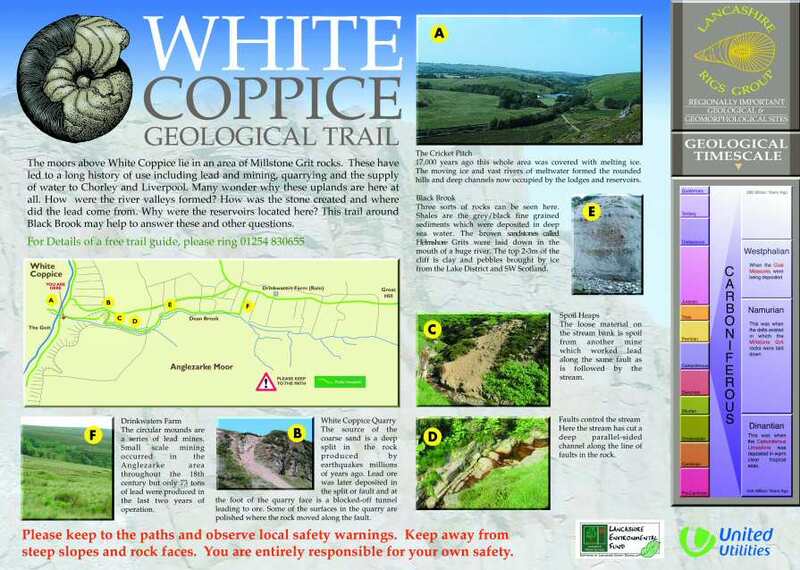 We have also produced a number of interpretation boards in collaboration with local graphics designer, Chris Beaton of Gaia Graphics. 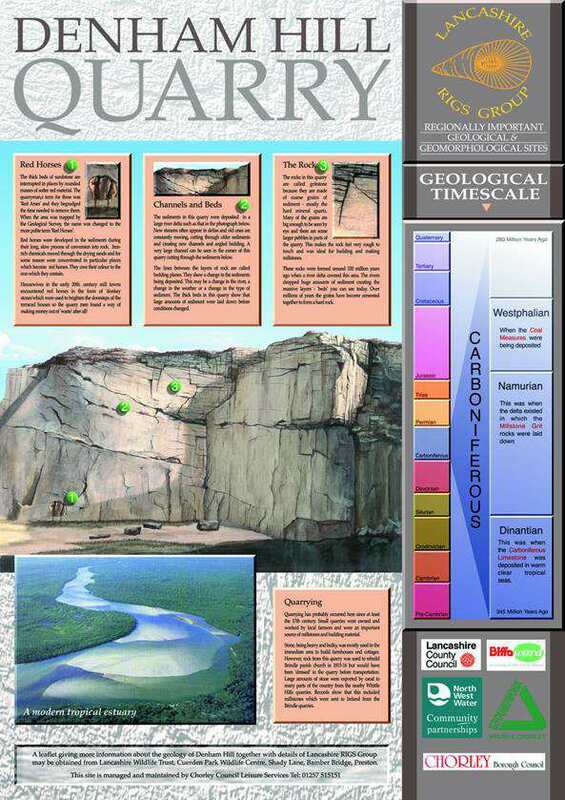 These excellent teaching aids explore the geology and landforms of a variety of sites and may be purchased as posters. All prices include postage and packing. Orders should be made to the Group secretary. (Cheques should be made payable to ‘Lancashire RIGS Group’.) Go to ‘Contacts’ for the address to order.